LISTEN NOW! John and Pat discuss John’s move down to the emerald coast. He continues to discuss his travels driving a 26 foot truck, towing his car and family following in a separate car. They discuss some of the beautiful landscapes he saw on his trip including the huge mountains in the Shenandoah Valley of West Virginia. 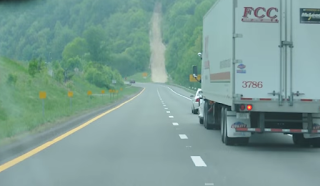 John continues to share how steep the mountains were and that when he had the gas pedal pressed to the floorboard the truck would only go 35 miles an hour. As they continued to speak about the beautiful mountains and valleys John describes how it felt coming down a 6 mile stretch off the mountain. It was a very steep decline which would cause you to ride the brakes all the way down. The truck at that point was traveling at very high speeds. The steep decline can be so dangerous that on the side of the mountain a strip of the mountain was constructed for runaway truck so they can bring their trucks into what looks like a slope to avoid crashing and collisions. They continued to discuss that so many people are living their lives at 100 mph recklessly down a slippery slope decline all the while ignoring God’s warning signs; flashing lights, stop signs, U Turn, Dead End… Sometimes there are even runaway ramps set up by God where you can bring your out of control life crashing into. It’s a safe place; a place for you to come to and that’s at the feet of Jesus, in repentance. It’s time get off this reckless road and get onto the highway to heaven but that can only happen through repentance.